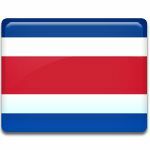 The Republic of Costa Rica annually celebrates Independence Day on September 15. This is the anniversary of declaration of independence from Spain in 1821. The term “costa rica” (Spanish for “reach coast”) was applied for the first time to the present-day Costa Rica by Christopher Columbus in 1502 during his last voyage. He noticed, that people had many gold jewelry, that led to the conquering of the land by the Spanish in 1524. Costa Rica became one of the parts of the Captaincy General of Guatemala, in 1563 the Spanish founded the city of Cartago, that was then-capital of the colony. However, due to Costa Rica's distance from the capital of Guatemala, prohibition to trade with southern neighbors from Viceroyalty of New Granada and lack of labor resources, development of the territory slowed down and it became the poorest Spanish colony. Like the rest territories of the Captaincy General of Guatemala, Costa Rica declared independence from Spain on September 15, 1821. Nowadays this event is known as Independence Day and people have a day off to celebrate the holiday.